It’s Spring Break And . . . I’m Cooking! It’s finally that time of year again…spring break! Words cannot begin to describe how happy I am to be able to take a short (but much needed) break from school, unwind, spend time with my family and do fun things. Tomorrow, I kick off my spring break by cooking on In The Kitchen, a segment of the Connecticut Style show! I did the show during my Thanksgiving break and had a great time making my “Fish In Parchment” recipe from Cook Your Way Through The S.A.T. with the two hosts, Jocelyn Maminta and Theresa LaBarbera. They invited me back and this time I am making the ultimate breakfast to CONSUME before taking any ASSESSMENTS, especially standardized tests. 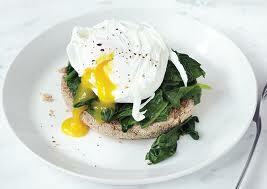 I will be making poached eggs with spinach on buttermilk biscuits. In addition to cooking, I will be talking about why eggs are one of the best things to eat before taking a test, due to their high content of protein. My Dad cooked me steak and eggs before I sat for the SSAT and I am convinced the meal helped my score. I had scrambled eggs this morning before my math final. Wish me luck with that, and with the show! This entry was posted in Main Course, Recipes, Vocabulary. Bookmark the permalink.